The Likebook Mars is made by a company called Boyue that’s based in China. Boyue has been making ereaders for several years now, sometimes under different brand names (like InkBook), but the Likebook Mars is their first to run Android 6.0 (the other models have software based on Android 4.2 and 4.4) and it’s also the first ereader to come with an octa-core processor. The Likebook Mars is model T80D. It’s basically an upgraded version of the Likebook Plus (T80S). It has a recessed 7.8-inch E Ink screen with 300 ppi, and it has a dual color frontlight with warm and cool light tones. However, the colors can’t be blended like with Kobo ereaders; instead you can only switch between cool and warm. Apparently it comes with the Google Play store pre-installed now. At first it didn’t so I was using APKPure to download apps. Personally I don’t like the default Boyue reading app at all. It butchers the layout of ebooks and uses its own wonky formatting with a bunch of spacing issues. Luckily other apps can be installed. I like KOReader a lot better than the default app, and it was designed for E Ink devices so it works quite well. One nice thing about Boyue’s software is you can set a default app to open books from the homescreen and library view so you don’t have to use the built-in app if you don’t want to, and the library view is nicer than KOReader’s. As shown in an earlier review, the Kindle app works pretty well too. Boyue updated the Likebook’s software right after posting that review and now the Kindle app refreshes better than it did before. Overall the app works pretty well on the Likebook Mars, but the font choices aren’t ideal for E Ink. The Likebook Mars also has Bluetooth for connecting things like keyboards and speakers, along with a headphone jack. If doesn’t have text-to-speech like Onyx’s ereaders, however. It doesn’t come with very many apps pre-installed, just some core apps like a music player, an image viewer, and a basic file manager. It does include a web browser that works pretty well considering the E Ink screen, much better than the Kindle’s awful web browser. Android 6.0 is a big step up from their previous devices and it offers a lot more possibilities than a typical ebook reader. The adjustable frontlight is nice and it has a good range of brightness settings and it isn’t too bright at the lowest setting. It’s surprisingly fast and responsive with the octa-core CPU and 2GB of RAM, and it offers some hardware upgrades not available on most other ereaders, like a memory card slot and headphone jack. The built-in reading app isn’t very good. 3rd party apps don’t refresh as well as they could, so there’s lots of flashing and afterimages. The software still feels like a work in progress; Onyx’s Android 6.0 ereaders are more refined by comparison and offer a lot more features, especially when it comes to reading PDFs. 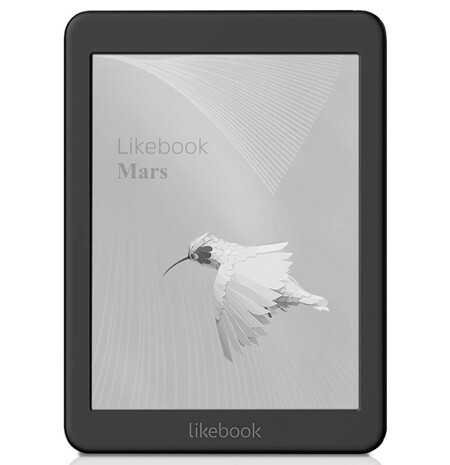 The Likebook Mars has a rather basic design somewhat similar to the Kindle Paperwhite. It doesn’t have any page buttons and the lack of a hardware back button isn’t ideal with Android (sometimes you get stuck in an app without the menu bar and the only way to get out is to reboot). It doesn’t have a flush front screen, and it’s not as thin and light as the Kobo Aura One, and it also lacks waterproofing and a premium feel. Given that, the price seems a bit on the high side, but you’re paying for that octa-core CPU and open Android experience. If you just want to read Kindle or Kobo books, you’re better off getting one of those devices (in fact you could buy both a Kindle Paperwhite and Kobo Aura 2 for less than the Likebook Mars). But if you’re the kind of person that wants some extra features and customizable options and don’t mind loading in other reading apps the Likebook Mars is a solid option. In fact it’s one of the best Android ereaders to get released thus far. Personally I like Onyx’s software better, especially when it comes to reading PDFs, so stay tuned for my review of the 7.8-inch Onyx Boox Nova when it gets released soon. It’ll be interesting to see how the two compare. 7.8-inch E Ink Carta screen. 1404 x 1872 pixel resolution (300 ppi). Frontlight with option to use cool or warm color temperature. 1.42GHz Freescale RK3365 octa-core processor. MicroSD card slot for cards up to 128GB. Supported formats: EPUB, PDF, MOBI, TXT, FB2, HTML, PPT, DOC, plus more via 3rd party apps. Sells from Amazon for $239-$269 (the price fluctuates). I got mine a few days ago as well from the seller on aliexpress. Enabling playstore worked fine on mine, simply switching on the Google Framework under Boyue Settings – Apps – Configure (the little symbol in the corner). It seems to download the Playstore afterwards, I didn’t see it right after turning the switch on, but after a few minutes it showed up. 1) I installed the Button Savior app, also to be able to use full screen apps without getting lost. The Recents button in there should normally work (does on the Onyx Boox Note), but doesn’t do anything here. 2) After connecting a Bluetooth keyboard I tried switching apps with Alt+Tab, but again nothing happens. Can you reproduce the issue, Nathan? I’d also hope to get root, as I’d like to run a Linux chroot (and install adaway, run Titanium Backup etc), but for that I was at least aware that it might be tricky. A final little note of comparison between the Onyx Note’s SOC and the Likebook Mars’, it actually seems that Onyx’ quadcore is a tad faster than Boyue’s octa core, at least in a synthetic benchmark like Geekbench 4. In use, the Likebook actually feels a little bit faster to me, it feels like I have fewer instances where the interface is unresponsive and I have to tap again. Happens occasionally on both, but maybe a bit less on the Likebook (although I’ve only had the Likebook for a few days, so it might not be a stable observation). I miss the recent apps list too. It works great on the Onyx Note and I use it all the time to quickly change between apps. This device is really promising in terms of its hardware specs (quad core processor, lots of RAM, hi-res screen, etc. ), but despite years in the e-ink Android business, Boyue inexplicably sent the Mars to distributors with an operating system that is both minimalist, and (odd in my experience of e-ink Androids), proprietary, largely locked down, and buggy. The result is something like a Kobo that has been rooted with partial success and that accepts some side-loaded apps, but none of them work well. If you only wanted to read epubs and did not care about customizing this or using it as a black-and-white tablet, then you might make peace with it, but then you’d be better off with a Kobo or Kindle, really. My experience with the Mars is overall: poor. It won’t use an alternate launcher accurately, and tries to force one to use the minimalist Boyue homescreen. It sometimes takes minutes (over three) to boot, and sometimes (and not just after an update, but at random times) reboots in Chinese. Not good. Play Store did not come with this and can only, in my experience, work very provisionally with this, even if one manages to force Play into this system. Another significant impediment that Boyue places on the reader is a block against side loaded fonts, something that even Kindles allow. The point of this–a quad core processor and 2gb of ram–could have been to offer people a lightning fast e-reader with the abilities of a color tablet. What was shipped is less than the average Kobo in terms of functionality; I wouldn’t trust subsequent iterations of this to be much better, given how balky and proprietary this one is. A baffling regression in the development of e-readers, given the easy possibilities. Shame you had such a negative experience with the device. I had it boot into Chinese once as well, luckily it’s easy to set back to English though (and only happened to me once). Booting seems to take a while indeed, but I’ve set it to not shut down on its own, so far no problem with that. The apps I was hoping to use work pretty ok for me (Librera, MoonReader+, Syncthing, Naked Browser, QuickEdit), so except for the lack of root at the moment and the weird inability to switch quickly between apps I’m actually quite happy with it. As far as Launchers are concerned, RelaunchX works quite decently for me (I think Nathan also mentioned it in some previous video). Haven’t tried any other launcher like Nova though, as Relaunch generally feels the most usable for me on e-ink devices. My standard of reference isn’t exotic: I am comparing the ease of using the Mars with either the Boyue T-62D or the Onxy i86 eink Androids. Both of those were easy to set up as Androids, using Nova or Apex launchers and variety of apps, and the Boyue T-61D did not come with, and never got, Play. No matter; I could use the Amazon app store or side-load apps. The Mars will sometimes allow side-loading, but e.g., ES File, which I have used on other eink devices, like many apps I tried, does not really work. Amazon app store: does not work (the Mars obscures the proprietary codes the Amazon acquired apps need to work). . Side-loaded fonts: do not work. Moon+ can be loaded onto the Mars, but without fonts of my choice, it is pointless. I am walking in the other direction from this device, and it is going back to its seller this week. The Boyue reading app has plenty of faults but sideloaded fonts work just fine. Also ES file manager has become an awful app regardless. Other file managers work, like Astro and ReLaunchX. With these kind of Android ereaders you have to accept that some apps just aren’t going to work well with E Ink. There’s no way around it. There’s probably a way to get alternate launchers to work but it takes time for testing. Again, ReLaunchX works well since it was desiged for E Ink. Personally I think Moon Reader is terrible on E Ink but other people love it. It’s all a matter of preference. Just candidly reporting my experience: the Mars I have does not accept side-loaded fonts, period, and I spent a fair amount of effort on that. Apparently what we are seeing, given the variety of reports here, is a set of different operating environments that have shipped with the Mars, an inconsistency which in itself does not recommend this device. I think Moon + is fine with eink; I much prefer it even to Kindle’s standard for note taking and highlighting, etc. That’s odd. I copied a fonts folder from the memory card to the root directory with the Chareink font and the app picked it up after rebooting, as shown in the video. Considering this is Boyue’s first Android 6.0 ereader that was just released last month I’m not surprised at all by the software inconsistencies. But having just reviewed the lackluster InkBook Lumos, the Mars is a massive upgrade and the software is a lot more responsive and stable. I may have mentioned in a comment elsewhere on this site . . . that the SD card in my Mars was formatted by the Mars to read-write *only within the device itself*. This means the external SD card does not show when the Mars is cable-connected to a Windows machine, and if the card is taken out of the Mars, it is unreadable in *any other device*. It effectively becomes an externally invisible subfolder of the Mars’ hard drive. Is this another oddity unique to my version? I rate that as really undesirable in an e-reader, anyway. What about battery time? Will it last a few weeks with 2 hours of reading every day? It’s hard to guage after only having it for a few weeks. The battery goes down like a tablet when using it as such, but when just reading with WiFi off the battery life seems pretty good. Good afternoon, could someone tell me if this device comes installed Portuguese language Brazil? I bought the Onyx Note and I am not satisfied because it does not have my language and with this the device uses only the amazon application and others. I’m using the Spanish language, but I was very sad about it. I intend to sell it, but here in Brazil few people know about this device. At this point it looks like it only supports English and Chinese. Can I install Others apps(apk) not from Google play store or Apk prue? Yeah you can sideload apps from where ever.